A Study in Scarlet by Arthur Conan Doyle (Author) A Study in Scarlet is a detective mystery novel written by Sir Arthur Conan Doyle, introducing his new characters, "consulting detective" Sherlock Holmes and his friend and chronicler, Dr. John Watson, who later became two of the most famous characters in literature. Conan Doyle wrote the story in 1886, and it was published the following year. 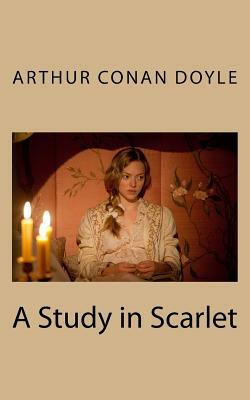 The book's title derives from a speech given by Holmes to Doctor Watson on the nature of his work, in which he describes the story's murder investigation as his "study in scarlet" "There's the scarlet thread of murder running through the colourless skein of life, and our duty is to unravel it, and isolate it, and expose every inch of it." We are delighted to publish this classic book as part of our extensive Classic Library collection. Many of the books in our collection have been out of print for decades, and therefore have not been accessible to the general public. The aim of our publishing program is to facilitate rapid access to this vast reservoir of literature, and our view is that this is a significant literary work, which deserves to be brought back into print after many decades. The contents of the vast majority of titles in the Classic Library have been scanned from the original works. To ensure a high quality product, each title has been meticulously hand curated by our staff. Our philosophy has been guided by a desire to provide the reader with a book that is as close as possible to ownership of the original work. We hope that you will enjoy this wonderful classic work, and that for you it becomes an enriching experience.